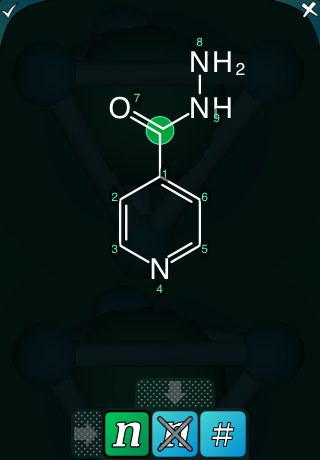 The next version of the Mobile Molecular DataSheet is going to add a couple of user interface segments for viewing and editing the atom mapping number property. 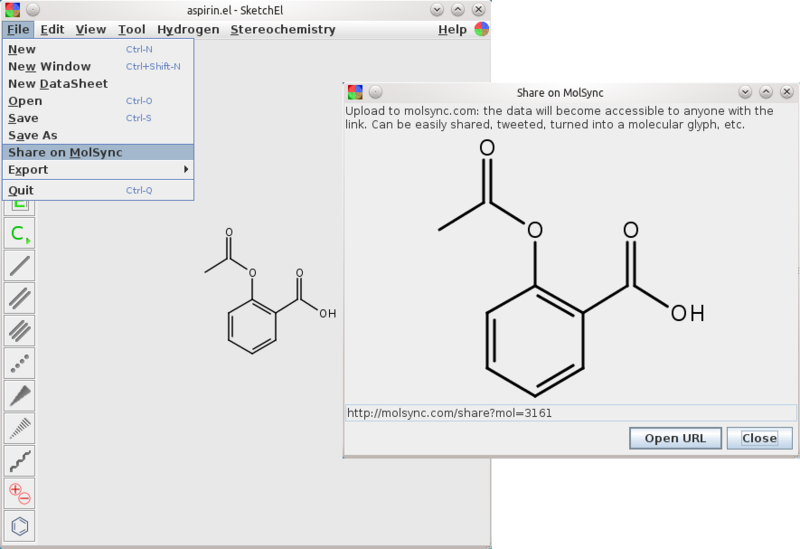 Shown on the right is the menu bank for providing mapping numbers for an individual molecule. Perhaps not so very interesting in and of itself, but the next step is to construct a slightly more intricate user interface for providing atom-to-atom mapping pairs for reactions. In case you’re wondering, the answer is yes: this is going somewhere specific. Atom-to-atom mapping is a core prerequisite for getting into the world of reaction transforms. Since the Living Molecules app is now live on the iTunes AppStore, it’s time to say a little more about what its intended purpose is. 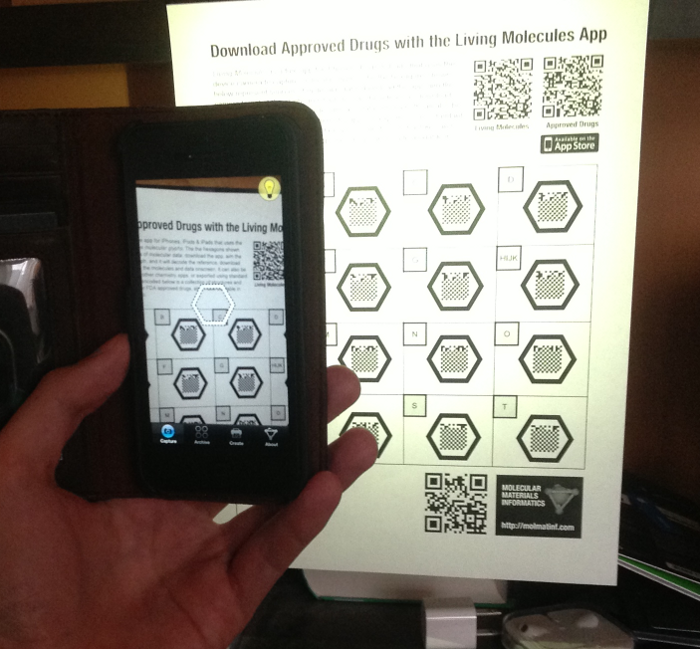 While the potential uses of a “molecular QR code” system probably include a whole lot of things that I haven’t thought of, the original concept was inspired by the idea of adding supplementary information to posters. The example poster on the right (click for the PDF version) takes the concept of “supplementary” to an absurdity, but that’s OK, because it’s a demo poster made to prove a point: each of the 17 molecular glyphs corresponds to a portion of the molecule collection that makes up the raw data for the Approved Drugs app. The data is hosted on molsync.com, where it has been residing for some time (note that it can also be found in the Drug Repurposing topic for Open Drug Discovery Teams). If you were to print out this Letter-sized poster and stick it up on a wall, anyone who walks up and takes a look at it will either: (1) recognise the molecular glyphs for what they are, whip out their iThing and open up their already installed copy of Living Molecules; or (2) read the explanatory text to find out what it’s all about, snap the regular QR code at the top to get to the iTunes AppStore to download the free app, then proceed as for (1); or (3) send me an angry email demanding that an Android version be made available immediately. For a more realistic poster, which is describing actual science rather than a techno-utility, >95% of the surface area of the poster would be taken up with the usual things: title, attribution, feature pictures, captions, text, graphics, etc. 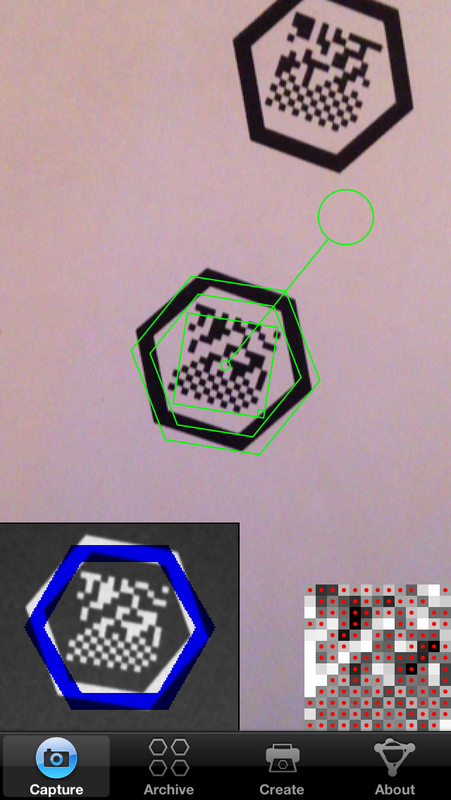 A modestly sized molecular glyph might be found in a corner, with a little note mentioning something like “The actual data used to produce the structure-activity plots shown above is available by capturing this glyph“. The latest version of SketchEl (1.60) has added a new feature: sharing of content via molsync.com. From either the molecule editor or the datasheet editor, the underlying content can be directly uploaded, making it openly accessible to the greater internet. While SketchEl is not technically a product of Molecular Materials Informatics, the copyright is held by me, it’s made available via the Gnu Public License, and it gets a bit of maintenance from time to time. It is a conventional and fairly capable 2D structure drawing program that is written in pure Java, and runs on all the major platforms. It can even be used as an applet, though that doesn’t matter as much as it used to. It also allows editing of molecular spreadsheets (“datasheets”) that contain molecules and various scalar data. Over the years (since 2005) it has served as a test bed for a few ideas, like the SketchEl molecule file format, and I still use it regularly for editing structures and collections. This is the same workflow that is available via several mobile apps, like MMDS and MolPrime+, either for sharing directly as a web page, or as a prelude to tweeting out the data. Once you have the data uploaded to the site, the content is served up in viewable form, and can be downloaded in various cheminformatics and graphics formats. It can be shared by any sort of internet distribution means, and there are lots of clickable icons for bouncing it out via Twitter, Facebook, LinkedIn, Google+, etc. Of course, using many of the content creation apps the data can be created on a mobile device as well, but adding the feature to SketchEl now makes that a choice: create content on mobile or desktop, whichever is most convenient at the time. And it’s not just for making posters either, but that is one of the original use case proposals. 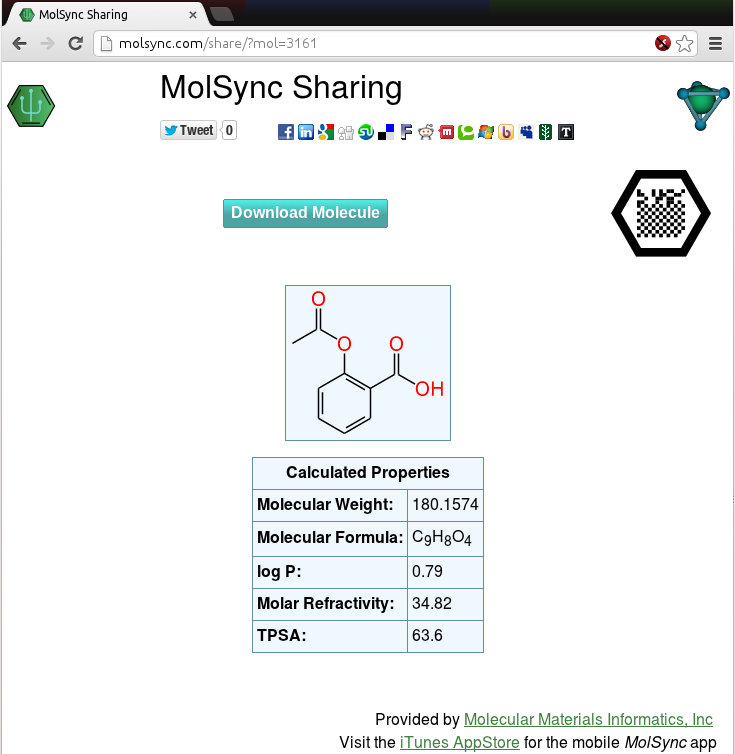 The molsync.com sharing page has a new feature, as shown on the screenshot to the right (click on it to see the live version): there’s now a black hexagon with a grid pattern in the middle, which is a molecular recognition glyph designed to work with the Living Molecules app. The simplest way to describe it is that it’s a molecular QR code, suitable for inclusion on posters or various other documents. The content can be accessed by using the Living Molecules app to “snap” the glyph, after which it continues on to download the data and make it available for viewing, storing and exporting. The app has been submitted to the iTunes AppStore, so with any luck, it will be available for download (free) in a week or so!